These are the rocks that hide the magnificent fossils of the Vendian. You must knock the cliffs down in a safe way and then carefully examine all of the surfaces for fossils. 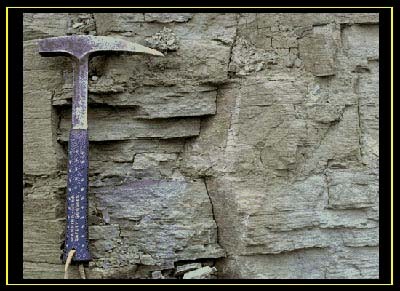 You can see the bedding planes of these sedimentary rocks very clearly. The bedding planes run parallel to the bottom of the sea in which these animals lived, roughly 550 million years ago.